BAK Industries designed and patented the popular BakFlip hard folding tonneau, which is the only hard folding truck bed cover to give you full access to the entire truck bed. While tri-fold tonneau covers are very popular, BAK has taken the category to new heights with it’s range of BakFlip Quad-fold tonneau covers. Hard folding truck bed covers provide maximum security, weather protection, and durability for the truck bed. There are several different styles of hard folding tonneau covers in stock at Truck Access Plus in Phoenix, Arizona. The most popular styles are sleek, low-profile hard folding truck bed cover like the BAKFlip MX4 or UnderCover Ultra Flex. These provide full bed access in seconds and lock on the rail system which is clamped-onto side of truck bed. Other brands like Extang truck bed covers offer more heavy-duty panels which are more dent-resistant. The Solid Fold 2.0 or Encore by Extang have a textured matte finish and are secure when tailgate is locked. Visit our showroom to learn about truck bed covers for your Chevy, Dodge, Ford, GMC, Honda, Nissan, Ram, and Toyota trucks. Having a hard tonneau cover on the pickup truck bed offers piece-of-mind knowing your truck cargo is secure. 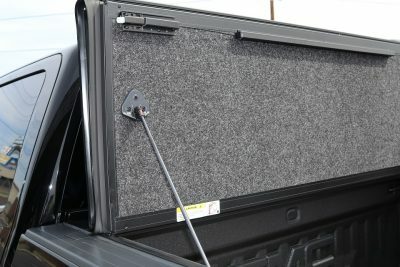 Truck Access Plus is a Phoenix store that has full size displays of tonneau covers that allows you touch and feel the truck bed covers before having the experts install a tonneau cover same day while you wait! If you need a truck bed cover today, visit to our pickup truck bed cover store to select from a large selection of tonneau covers in stock today. We carry industry leading brands and have massive inventory on hand for all pickup trucks. Installing hard folding tonneau covers while you wait is our specialty. Hard tri-fold tonneau covers provide instant bed access with easy to use folding panels. Truck Access Plus has hard folding tonneau covers in stock at Phoenix, AZ truck bed cover warehouse. Hard tri-fold pickup bed covers can be installed in 30 minutes while you wait! Come and feel the products on full size display in showroom.